Borderlands 2 is the direct sequel to the surprise hit original game, and though there's no accounting for taste, it's widely regarded as the best of the three. In addition to some outstanding graphics and character design, varied weapons and enemies, smart use of special abilities and upgrades, and just a general feel of badassery, Borderlands 2's sci-fi story is surprisingly engaging and well-paced. The villain Handsome Jack is worthy of particular note - hell, the smarmy bad guy is so entertaining that he returned for The Pre-Sequel and Telltale's adventure series. 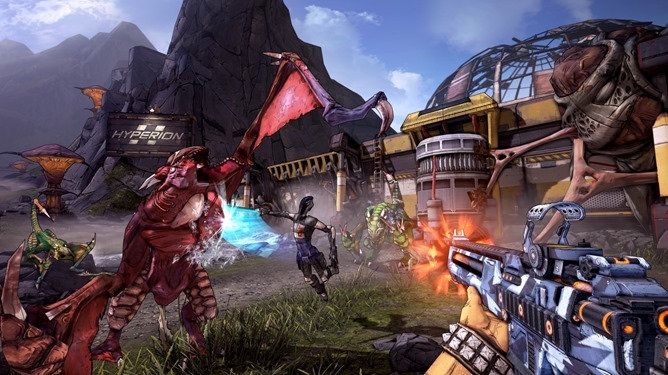 Side characters like Tiny Tina, Mister Torgue, and returning player-characters from the original Borderlands are all engaging too. Surprisingly, Borderlands 2 will be available on both the SHIELD Android TV and the slightly less powerful SHIELD Tablet. And at some point, Borderlands: The Pre-Sequel will become available for the tablet, too. When? NVIDIA says they're both "coming soon" without any definitive date, so I'm guessing sometime in the next couple of months. A little note from Android gaming history: in the excited lead-up to Borderlands 2 back in 2012, there was a brief rumor running around that 2K was making an Android version of the game, stemming from the fact that trailers were playing on Android tablets at a gaming conference. It wasn't true then, but it is true now, at least in the admittedly shallow pool of SHIELD exclusives.